4-Word Review: The search for Lenore. 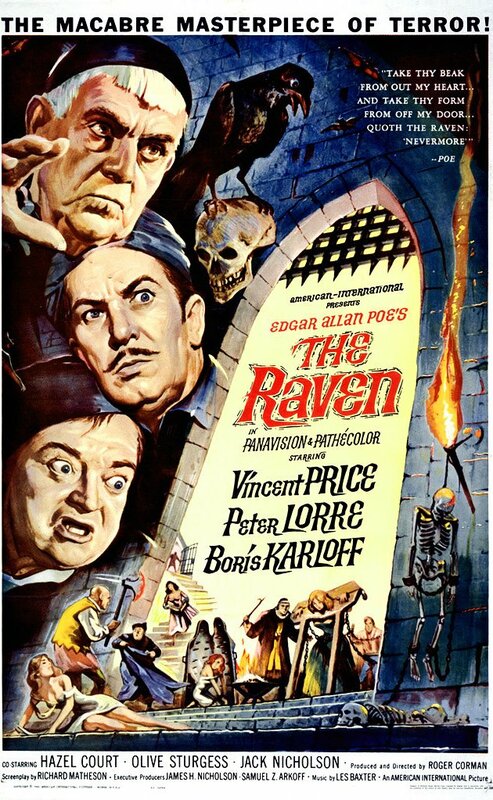 Dr. Craven (Vincent Price) is a former sorcerer who one night is visited by a talking raven. 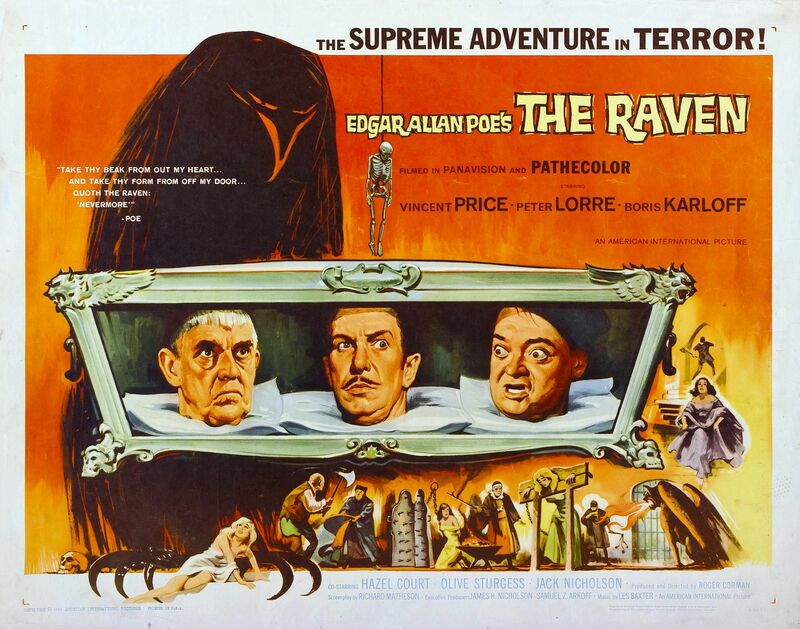 The raven is actually Dr. Bedlo (Peter Lorre) who has been turned into a bird by the evil Dr. Scarabus (Boris Karloff). Craven manages to concoct a potion that allows Bedlo to turn back into his human form and in appreciation he tells Craven that he has seen Lenore (Hazel Court), who Craven was once married to and was thought to be dead, living with Scarabus in his castle. Craven decides to pay Scarabus a visit to see if this is true and brings along his daughter Estelle (Olive Sturgess) as well as Bedlo and Bedlo’s son Rexford (Jack Nicholson). When they arrive they are greeted by the conniving wizard who at first denies any wrongdoing, but it soon becomes clear that he is jealous of Craven’s powers and wants to attain them for himself, which leads to a climactic cosmic duel between the two sorcerers. This film marked the fourth collaboration between writer Richard Matheson and director Roger Corman and for the most part it is an entertaining success. The two apparently had so much fun creating the comic story of ‘The Black Cat’ in Tales of Terror trilogy that they decided to do a feature length horror/comedy that is very loosely based on the Edgar Allan Poe poem. Despite being shot in only 15 days the film isn’t as limited by Corman’s usual low budget constraints and I was genuinely surprised how imaginative the special effects where and the overall impressive background sets. The film’s biggest boost is clearly the three lead actors who are all at their absolute peak. I especially enjoyed Lorre who brazenly steals every scene he is in and ad-libbed many of his funny lines much to the consternation of his co-stars. In fact if Lorre wasn’t in this it wouldn’t have been half as enjoyable. A young Nicholson as his son is equally entertaining and the frosty relationship that the two characters have was apparently a carry-over from how they felt about each other from behind-the-scenes. Some of the effects are clearly animated, which looks tacky and as the group arrive at Scarabus’ castle one can see that the place is merely a painting matted on the screen. The story also does have its share of lulls, but all of this gets forgiven by the climactic sorcerer’s duel, which is the film’s highlight. 4-Word Review: He tries some acid. Jack Nicholson wrote the screenplay to this film which is based loosely experiences he had while taking LSD as well as the break-up of his marriage to actress Sandra Knight. The story centers on Paul (Peter Fonda) a director of TV commercials whose marriage to Sally (Susan Strasberg) is on the rocks. He has a need to ‘find himself’ and seeks help from his friend John (Bruce Dern) who is a self-styled acid guru. John gives Paul some acid while promising that he will stay with him during his drug induced trip. The rest of the film then deals with Paul’s experiences both in his mind and in his dealings with the outside world while he is hallucinating. 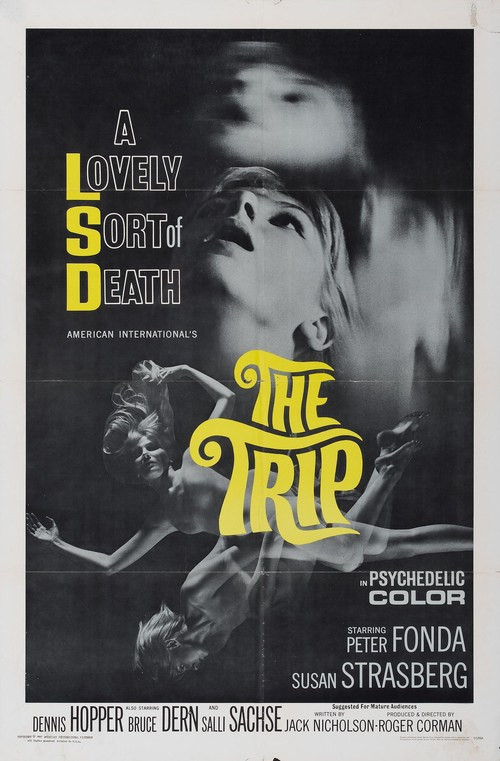 To prepare for the film Nicholson, Fonda and Dennis Hopper, who appears in a minor supporting role, all took part in a group LSD trip and the various visions that they experienced are incorporated here. Director Roger Corman also tried LSD at a different time to prepare for the film. The only one not to try it was Dern who was staunchly opposed to recreational drug use and in fact even his character doesn’t take any as evidenced by a scene where everyone is taking a puff of some marijuana and when it gets passed to him he simply passes it to the next person without trying even though everyone else does. The scenes recreating the acid trip are not all that interesting or imaginative. It’s all pretty much what you would expect with a barrage of artsy colorful designs popping up at the viewer in split second intervals that reminded me very much of looking through a kaleidoscope. The images aren’t coherent, nor meant to be, and become vapid in the process. The scene involving Paul sitting on a merry-go-round while trying to justify his existence to Hopper who is dressed in a devil-like costume gets quite tedious. Things improve during the second half when John, who promised he would stay at Paul’s side during his trip, ends up leaving him momentarily to retrieve some apple juice. During this time Paul escapes from the home he is in and goes out onto the city streets. The editing and effects here are impressive and ahead of its time. Some of the visits he has with the people he meets prove interesting including an offbeat conversation that he has with a lady that he meets inside a Laundromat as well as one he has with a very young girl inside her house. Although he starts out shaky I felt Fonda’s performance was pretty good and this may be one of the best roles of his career. Strasberg who receives second billing appears just briefly and has very few speaking lines. Dern is always fun when he is playing eccentric or intense characters, but here where he is playing a relatively normal one he is boring. His part was originally written for Nicholson to play and I think he would have done better. I was expecting some sort of tragic or profound-like ending especially with the opening paragraph that starts the film and is read by a narrator with a very authoritative newsman-like voice describing the ‘horrors’ of drug use and how it is becoming a serious societal problem. However, nothing really happens. The movie just kind of stops and that is it. The weak conclusion hurts what is already a so-so film making it like the drug itself an interesting experiment, but nothing more.